60s. Can you identify this player? Born in what might be called a rugby league stronghold in Cumbria, this winger had a long playing and coaching career. He signed for Newcastle from a club that had Celtic in it’s name, but played in his home county and spent a couple of years there after scoring on his full debut for them against Fulham at Craven Cottage. He then moved to the other end of the country to play for a bunch of drupes and a scoring record of one goal in every three matches there earned him a move to sarf London a couple of years later. He then moved on to the club where he later spent a long time as a coach (at one point working under a manager who had been a team mate at Newcastle and later became a City player) and then secured a move west back to the London area. It was while at this latest club that he scored a goal which, it could be said, broke a lot of City fan’s hearts. 70s. Nicknamed “Zico” by Geordie fans, he was in a Newcastle team beaten by City at Ninian Park in this decade and later played for us. He also won fifty one caps for his country, but who is he? 80s. At one time, part of a transfer which saw an England international centre half move to Moss Side from a few miles south of Tyneside, this defender made the short journey to the Geordies in 1982 and scored against City for Newcastle during this decade – Ankaragücü were among the clubs he played for after leaving Tyneside, but can you name him? 90s. The player pictured was regarded as an outstanding midfield prospect when he started out at Newcastle early in this decade, but “nomadic” would probably best describe a subsequent twenty two year career which saw him play in three countries for eleven different clubs (he never played a hundred times for any of them in one stay). 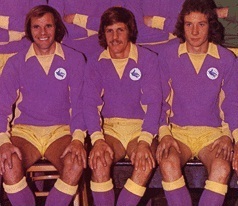 The last match he played was in Cowdenbeath’s colours where he was Assistant Manager, but he had been the man in charge for a while at the Swedish club he had two separate spells with – who is he? 00s. Which member of a Newcastle side which played down here against City during this decade has a recent Premier League winner’s medal? 10s. Which scorer for Newcastle in a game against City during this decade subsequently played for a team that represented a state in Vincent Tan’s homeland, before ending his career with a club in the city of his birth – the only goal he scored for his country coming in a game against Switzerland in Limasol. 60s. Whitehaven born Charlie Woods signed for Newcastle in 1960 from a team called Cleator Moor Celtic. In 1962 he signed for Bournemouth and then he joined Crystal Palace after a couple of seasons on the south coast. Ipswich was his next stopping point and he played more games for them than anyone else. A new decade saw him sign for Watford and t was while he was with them that he scored a goal which played a huge part in ensuring City missed out on promotion to Division One 1971 as Watford somehow escaped with a 1-0 late season win at Ninian Park. 80s. Jeff Clarke was part of a player plus cash deal which saw Dave Watson move from Sunderland to Manchester City in the mid 70s and played nearly two hundred times for Newcastle’s biggest rivals before joining them on a free transfer – he scored one of Newcastle’s goals against us in their 2-1 win at St James’ Park in February 1982. 90s. Lee Makel, who had a spell as manager of Östersunds FK in the 09/10 season. 00s. Danny Simpson was in Leicester’s title winning squad in 15/16 and was at right back for Newcastle in their 1-0 win at Cardiff City Stadium in September 2009. 10s. Gabor Gyepes scored an own goal in Newcastle’s 5-1 win over us at St. James Park in February 2010. He went on to play for Sarawak FA and ended his career in 2015 playing for Soroksár SC, a team based in Budapest. For reasons I cannot begin to fathom, he scored his only goal for Hungary in a game against Switzerland that was played in Cyprus!